Hooray! It has been so long since I have a done a page just for me! And not just one. I have two pages! These papers are from a kit for a class I take monthly at my LSS. Not my favorite papers to work with so I decided to go a little out there. For some reason, the hexagon paper made me think of these clown photos from a visit to a Science and Industry museum several years ago. And for some reason, these papers work. I got the idea for the remaining product choices from Scrap Our Stash. I used 3 arrows, 3 buttons, washi tape, enamel dots, wood veneer and 3 stars. This one is an idea I got from a class I'm taking at Creative Passion classes. It's the World Series of Scrapbooking. If you know me, you know hoe much I love baseball. How could I say no to this class? The idea is based on a home run and running all four bases. In this case, creating a square on the page and adding an embellishment to all for corners. ok, so I have more of a rectangle, but it still works! Thanks for taking a look at my creative view. Come back again soon. I have lots coming up that I'll be sharing. Fun pages - it is nice to scrap with no reason other than to enjoy it. Love both of these layouts, Devra. 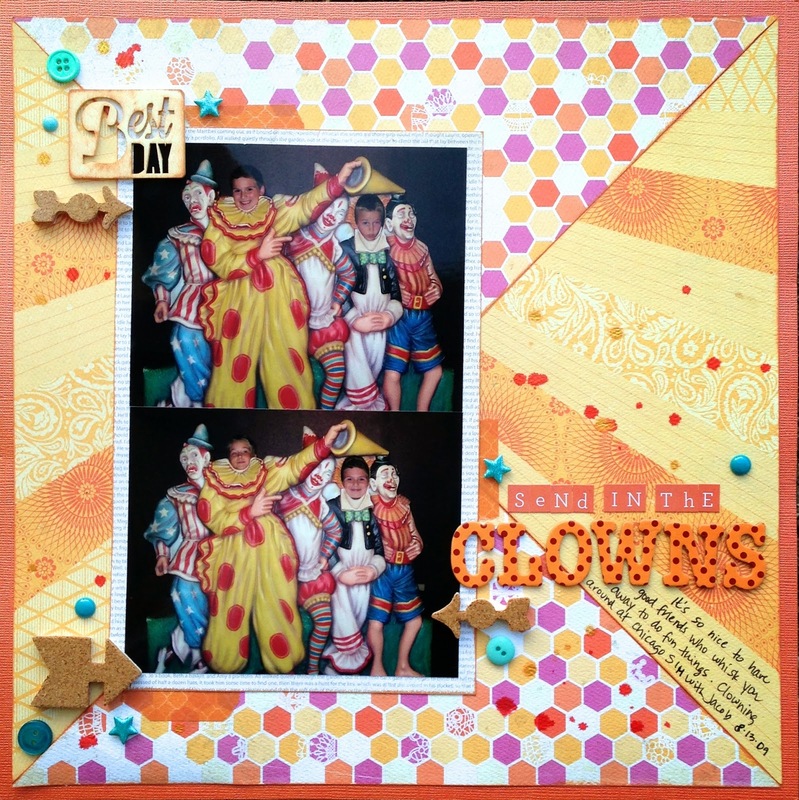 The clown one is so perfect for the photos and I love the way you cut the papers for the background! Great title and nice work with the shopping challenge. The second layout...awesome picks of Joshua. Love the product selection and the colors you chose to highlight them. Another home run!! Two lovely layouts! Love the triangle pattern in the top one and the title is so fun in the second one!! Great layouts Devra and great job with the stash challenge! Thank you for playing along at Scrap Our Stash! fantastic pages!! Thanks so much for joining us at Scrap Our Stash!! So happy that you were able to scrap for yourself!! It's so nice to not stress over what we are creating and just create!! I have to say that I love how the pattern paper worked in your first layout both were super cute! Both awesome pages! I love the titles on them too. Great page Devra! Love the colors combination! Thanks for playing along at SOS! These are both so cute and fun! Thanks for playing along at Scrap Our Stash! Always fantastic when we get to scrap for ourselves! !